After you've gone to all the trouble to cook the Thanksgiving turkey, it's a shame to mess up the presentation with inept carving, or to spoil the day by worrying about carving correctly. Chris Kimball of Cook's Illustrated demonstrates on The Saturday Early Show his own quick and efficient method for carving the bird. He says it's best to carve the bird before you bring it to the table, since carving at the table is a mess, it's time consuming, and for most home cooks, it is stressful. First, allow the turkey rest on a cutting board for about 45 minutes. Kimball suggests you use a board that includes a well around the edge to collect the juices from the turkey. Second, turn the turkey over, breast down, using a kitchen towel. The bird will still be warm/hot. Remove the wings by cutting each at the right spot, as Kimball demonstrated on the show, then twisting back the wing to expose the joint. Then turn the turkey breast side up and remove the leg and thigh by popping the leg out of the socket and then using a knife to finish the cut. Next, remove each breast intact using a boning knife, cutting down close to the center of the bird and then out. After each breast is removed, cut it into pieces with an electric knife if you have one , then move it to the serving platter along with the wing, leg, and thigh. The last step is to cut the meat away from the thigh, which has only one bone down through the middle. Kimball says to carve the entire turkey at once, since it's a messy process. 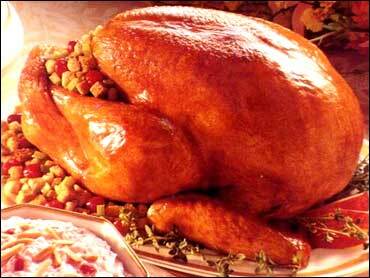 He says the best way to save leftover turkey is to wrap it in plastic and store it in the refrigerator. He has a few more turkey tips, too: For a tender, juicy bird, either purchase an injected bird or a kosher bird, or brine the bird yourself using 1 cup of table salt for each 2 gallons of water. Let the turkey sit in a cool spot (under 40 degrees F) overnight. For roasting a big bird, start at 425 degrees F for one hour breast side down, then turn the bird over and reduce the oven temperature to 325 degrees F. Kimball says it should take about 3 hours total for a 20 pound bird. Turkey should be cooked to an internal temperature of 180 degrees F.